Anyone, regardless of experience can land a writing job. Summary: I’m not a writer, never was a writer. Didn’t study English, didn’t work in any type of publishing or editing capacity. So, I was where you are… I liked writing and thought I could make some extra money doing it. In the end, I fairly easily landed 200 freelance gigs and earned close to over $20,000 before life got in the way. I’m more than happy to share how I got there, so if that sounds good, please continue. Please note though, that these results may not be typical, and definitely aren’t promised. I’m just trying to do what I can to help you find success yourselves, and really, overcome any fear you have of being inexperienced. It doesn’t matter. Anyone who ever started anything, anywhere did so without experience. That said, also remember that we aren’t talking brain surgery. I don’t mean that to say writing is easy, but rather, freelance writing is something you can easily jump into – and find success with – without experience. Brain surgery, not so much. Second. There are a lot of freelancers out there who warn against getting started on sites like Upwork or Fiverr, or Guru, and others. I actually say the opposite, and that those sites are exactly where you want to get started. 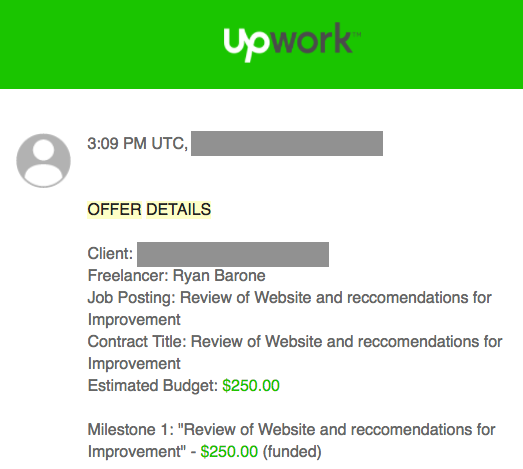 I understand the advice around trying to get your feet wet elsewhere, as Upwork can be highly competitive. But, Elance (now Upwork) is where I started with absolutely zero experience, and found great success…so I know for 100% fact it can be done. There are some things you must know about this blog post. One, it’s ridiculously long. Like 6,000 words. It’s the longest thing I’ve ever written. So, please use this clickable table of contents to navigate around. BONUS: If you want to download a detailed guide on “the 4 BEs,” I have it for you here. This is pretty much the foundation of my success, and suggest you read it before moving on. Be different: They (other freelances) bid low, you bid higher. They write robotically and formal, you write with emotion and conversational. Be a good person: They treat clients like names on a screen, you treat clients like humans and people who can – and will – dramatically influence your success as a freelancer. Be emotional: They crave appearing buttoned-up and professional, you crave making the client (and their readers) feel something with your writing. Be disciplined: They bid and create content without a process, you remain disciplined in your ways. These things may mean nothing to you now, but if you read this behemoth, put my tips into practice, and start finding success, you’ll come back and look at this same list and be in total agreement. I don’t even care if you “Commend/Ctrl +F” the heck out of this thing looking for references to the above. Those are things you won’t read elsewhere, but they are the true reasons for success. In a nutshell, I didn’t really enjoy writing until about my Junior year in High School, where I had a really good teacher who broke through and made me understand how writing can be enjoyable/powerful. For undergrad, I graduated with a BS in Marketing, and landed a job in a general marketing capacity. I soon started my MBA after that. After a few years in that marketing role, I started to blog and create a little content, where a spark was ignited, realizing I actually liked writing and was decent at it. In that short summary, is there anything there that really screams “future freelance writer”? No, it’s all pretty standard. I didn’t major in English, I didn’t work for a publishing company, I didn’t work as an editor’s assistant, etc. I was just a guy, who, because of the opportunities I was given and earned, got my feet wet with writing and enjoyed it. The only thing I did that relates to writing was blog a bit. So, still, you’re probably wondering why you should listen to me. I jumped in, without experience, or even if you want to argue, very little experience, and found pretty immediate/steady success. Still good? Let’s look at how I did it. As you see, a lot of this isn’t difficult. The hardest thing is probably getting started, and the second hardest is not getting frustrated when your bids are declined or clients aren’t completely satisfied with the work you provide. More on handling that to come. Even though you haven’t written professionally, you’ve undoubtedly written before. So, you need to start building a portfolio of your work…and already, let’s stop right there. Listen, this was one of my first roadblocks, so I want to spend some time on it. A “portfolio” sounds so daunting, so “professional” that it’s hard to imagine building one only being an amateur or a newcomer to the space. But, I’m telling you, on these freelance sites, you only need a few sample pieces to get started. And even better, those can consist of college papers, cover letters, etc. If it has been written, and you still have it give it a good hard look for your portfolio. Activity to Overcome Roadblock #1: Gather everything you have written. Ever; whatever you can find. Look through your files for, as mentioned, old papers, essays, cover letters, etc. Pick what you feel are the best pieces, read through them, and polish anything that needs work. Find anything you’ve already created, double check-it, and set it aside as a portfolio piece. If you truly don’t have anything to use, find a topic that interests you, pick a current event, and write something. Honestly, I never did this, and only relied on old works to get me started. So, I’m hoping many of you can too. I’m only going to leave the bits about your title and your hourly rate because they drive home the points of being different. Job Title: Ok, now we are starting to get into some of the things that can really make or break your proposal being accepted. My title when I first started was something along the lines of “Young mind with MBA,” or something to that effect. That’s it. Nothing flashy. Why did I chose those attributes to showcase? Because that’s what I felt I could offer that was different than anyone else. And that’s a big point that deserves more discussion. Roadblock #2: In a pool of thousands of people, how can you possibly stand out as a newcomer? It could be debilitating, trust me, I went through it too. Back then, I couldn’t say something like I was a better a writer than anyone else, because I had nothing to prove it. I couldn’t say I was experienced and had been writing for years, because that wasn’t even close to being true. Activity to Overcome Roadblock #2: Spend some time looking at the other freelancers you’re up against. What makes you different? Are you a female among many males? Are you a new college-grad among seasoned professionals? Are you a seasoned professional among new college grads? Do you possess a unique degree? Do you have some sort of unique experience? Find what it is that makes you different and go with it. Even if you do think you’re amazing, the best writer, the most affordable, blah, blah, blah, that stuff doesn’t work in your title because everyone else is already doing it. Be different, even if different means your claims aren’t impressive on paper. Looking at my personal example, I felt I was younger than a lot of people I was up against, and, with an MBA, I felt I could use that to my advantage as well. From there, if a potential client is looking through a list of 10 freelancers trying to find someone to write about something like millennials in the workplace, and they see nine profiles from random people claiming to be “Experienced freelance professional” and then one profile from “young mind with MBA,” isn’t it not too far-fetched to think they might be interested, even if you haven’t been writing for years? Hourly/Fixed Rate: Figuring out how much to charge as a freelance writer is tough, and a major pain point, right? As someone who has never done this before, which price is going to get you hired? As tempting as it is, don’t join the “race to the bottom.” Meaning, just because you see jobs littered with $5 and $10 bids, don’t join the fracas. 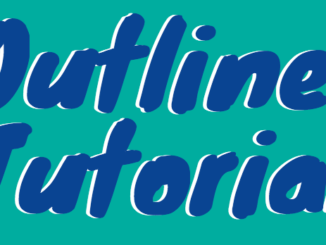 Roadblock #3: How do you confidently price your skills/avoid underbidding? Let’s look at the two extremes. As a newcomer, you’re probably more apt to bid as low as possible. But again, and referring to the “be different” mentality, what is joining a bidding group at $10 per job going to do for you when everyone else is bidding about the same? You become just another freelancer at that point, trust me. The key here is to one, stand out from the crowd with your bid. Just because you aren’t experienced doesn’t mean you aren’t good. Always remember that. Second, is it really worth your time to write an article, blog post, press release, whatever it might be for $10? I usually didn’t bid less than $50 per job. It just wasn’t worth my time to go less. Activity to Overcome Roadblock #3: Look through some potential jobs of interest, or, look at the average rate charged by other freelancers. What do you notice? Are those amounts you’d be happy earning? Think about how much your time is worth—not your experience level. Again, bid by the dollar amount you put on your time and not how experienced you might be. I decided to talk about the proposal before getting into the process of selecting jobs to bid on, etc. because I think it’s important at this point to just start doing. Roadblock #4: Paralysis by analysis, or whatever name you want to give it. Yes this is a very long blog post, but much shorter than most ebooks on how to get started in the freelance game. My point is, you can get so bogged down in research and planning that it burns you out or just scares you more, and eventually, all you’ve done is read, read, read, instead of do, do, do. So, jump in. You might waste a few bids on bad jobs, but that’s fine. It’s better than never getting started at all. The steps to creating the perfect proposal are easy, but you must be disciplined enough to follow them each and every time. You never know if the one time you get lazy is the one person who could have hired you for your initial project. And two, reading the description will really give you a glimpse into who you might be dealing with on the other hand. There are a few red flags to be cautious of, which will be discussed later. For now, read the description. Basically, there are a number of wrong ways to start, and really only one right way…by using the person’s name. All this requires is that you, yes, read the description. Using anything other than the client’s name is a clear indication that you didn’t read the description, or, you don’t care. Address the client’s specific needs and questions: Three sub points here. One, as mentioned above, you will be tested, so if a client asks that you “prove” you read the description, you need to make that a priority. How do you determine style and voice? Do you have experience in this industry or niche? The thing to remember here is, while the content of your answers is important, you’re also being tested, again. Those who answer with a couple of words, or in unrelated terms will surely be passed over. You also don’t want to overwhelm and waste a lot of time here, so answer adequately in 2-3 sentences and move on. And last, if they are looking for expertise in a certain area, do what you can to draw the connection between your skills and experiences to that certain subject area. Because you’re just getting started as a writer, you’re probably going to have to get creative. Here are some hints on how you might be able to go about it. Sports: “While I’ve never written about baseball, I played up through high school, and was pretty good. I’m still a huge fan now of the Oakland A’s, so I know the ins and outs of the game. Entertainment: “I’ve never written about movies, but have been involved in acting my entire life, not to mention my obsession with Hollywood, and staying up on the latest in all things pop culture. “I understand you’re looking for a press release about your new app. I’ve actually written on something similar, so please see the attached release sample. It’s mostly on the launch of a new website, but I feel there are a lot of similarities. Explain what makes you different: One of my major points from way back in the intro, remember? It’s imperative this be one of the first points you make in your proposals. Why? Because if you are new, with zero feedback, clients are quickly going to bypass your pitch. But, if you’re lucky enough to get them to read at least the first sentence, you have to get them hooked/address their major pain point. Point being, don’t be afraid to break the mold. It makes you different, and unique. It makes you authentic, and intriguing. It works. Do you know how many people took me up on such an offer? Very, very few. It works though because again, you’re admitting to the fact that hey, you are new, and maybe the bid is too high. Not to mention that it hints at your flexibility and willingness to make the client happy. Ask a question: This one is tricky. I don’t mean just ask a question for the sake of asking a question. The worst thing you can do is ask something irrelevant or, ask something that is answered in the job posting. “Let me first say your website looks great. Is this something you created yourself? Or, something like “Are you still looking for help with your app store description?” Such questions also give one extra hint that you did in fact read the job post and did your due diligence. 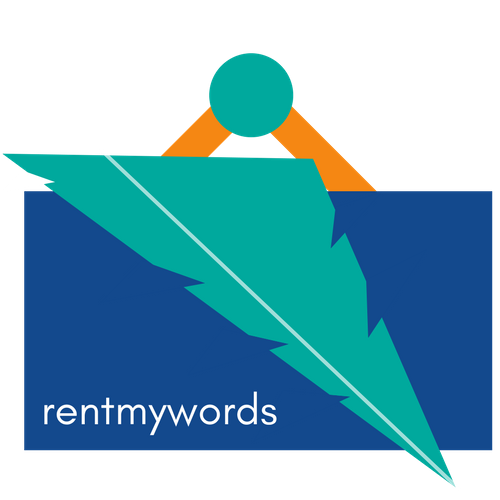 Offer a “free sample”: This one is a little tougher in the writing space, but, look for opportunities to provide a free sample of what is being asked. For example, perhaps the client is looking for a blog post writer with SEO knowledge, too. This could be a good opportunity to spend a few minutes doing some preliminary keyword research, and offering up a few proposed titles based on your findings. Another example is a client with a job looking for a new ad slogan. If you go the extra mile and provide a few preliminary ideas, it goes a long way in boosting your proposal over your competition. Yes, you risk they just take your idea and run! So, give a taste, but in a way that encourages them to reach out for more. Be human: This is twofold. Be human, as in, don’t be a robot. As tempting as it is to copy and paste proposals from job to job, clients can smell it from a mile away. In doing so, your proposals are going to lack any sort of personality. Then, I can almost bet you’ll inevitably make a mistake, using the wrong name, etc. from the job description you just copied from. Roadblock #5: Maximizing your time but still submitting tailored proposals for each and every job. It’s a tough balance, for sure. But trust me, you’d rather err on the side of taking too much time crafting proposals then becoming robotic. And, if you follow all of these tips anyway, you should find perfect harmony. Activity to Overcome Roadblock #5: So, to be human…take all of the tips above and have a conversation. Tone down the formality and pretend you’re acquaintances versus strangers. Use the client’s name, ask questions, show you care, provide freebies, etc. It all comes together beautifully to paint use a caring, skillful human. 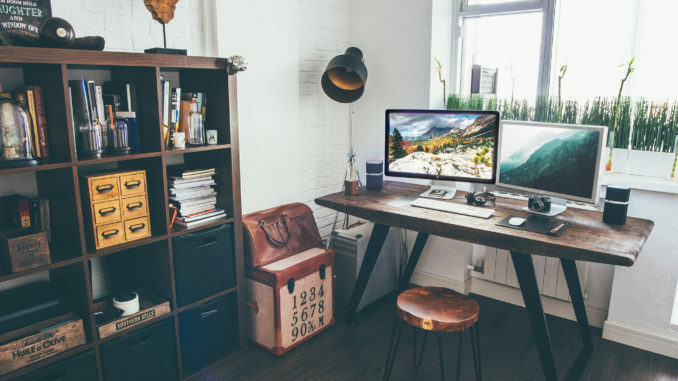 Your success as a freelance who lacks experience hinders on all of these items already mentioned, and those mentioned from here on out. But, it’s your system that really is the linchpin; the recipe that cooks up your proposals as wins and unfortunately poisons them sometimes, as losses. That said, there is no perfect system. Sorry. I can’t lay that out for you. What I can do, though, is provide the ingredients, and allow you to come up with your own concoction. This section is really deserving of its own blog post, and I’m actually working on that one as we speak. Until then, here are a few ingredients to consider. Selecting Jobs to Bid On: When you’re first getting started, this could be an exciting first step. As you scan a site like Upwork, you’re probably thinking something like “This is great…there are so many jobs! Blog writing, articles, press releases, web content, app store descriptions, and so much more. And then, an hour later, there are more jobs! And so many different categories! If you don’t have a solid system, the plethora of opportunities will eat you alive. Dedicate a window of time: I’d usually spend 30 minutes every day bidding on new jobs. Pick a time of day: I loved waking up and checking out the new postings, and literally going through everyone until I reached the previous day’s listings. You might be tempted to check for new jobs repeatedly through the day, but for the sake of your sanity, I highly recommend sticking to one designated “bidding time.” Plus, as you start to get hired, you need time to write! Getting sucked into bidding will take its toll on the quality of your work. Read between the lines: Meaning, read into the job posting to better understand the poster and their needs. Set boundaries, and know where you draw the line. For me, if a post was paragraphs on paragraphs long, I moved on. If the poster had a list of demands and needed you to go way out of your way to prove you were worthy, I moved on. One, these things take time, and two, they often indicate that the poster might be a little more difficult to work with than most. In the end, the juice wasn’t worth the squeeze. Do you have the bandwidth to provide the work in the time you said you would? Are you comfortable with the amount you bid? Are you comfortable with the content/topic you’ll be writing about? Are there any red flags with the poster? In your gut, do you feel they will be tough to work with? Bottom line is, you still have time to back out. And, while it might be difficult to walk away from a job, choosing the wrong one will set you back much further. I’ll be honest, I took a few jobs I wasn’t totally comfortable with, mainly having to do with the requirements or the poster themselves. I didn’t trust my gut, and I found myself dreading certain jobs. They turned into chores. Thankfully, I got through them, but there are some of the toughest times you’ll encounter, as you want to do a good job, but really just want the job over with. Rate of Delivery: Part of your process is deciding on turnaround time with project milestones. For me, I had a tough time doing a little bit on a project, then jumping to the next and working a little bit, and then the next, and so on. I found I couldn’t really focus until I worked to completion on a project before moving on. “Completion” in this sense means deliverable. So, I don’t mean finish the project before moving on, but rather, working until you finish a draft you can pass along to the client. Or, even, maybe just working to a point where you feel comfortable messaging the client and letting them know of progress. Now, again, this might not work for you. What is important is that you work to your comfort, and, if it’s not working, make a change. Revision Process: One piece of the puzzle that isn’t always under your thumb, but something you should try to control is the revision process. Meaning, to start, you are never (or very rarely) going to nail your project with the first draft. So, while you should work to make drafts as polished as possible, expect the client to come back with feedback. With that said, boundaries do need to be set. Now, how many times did I have to do this? Maybe a handful? Is it risky? Of course. You’re now opening the door for the job to not be seen through to completion, which could mean you don’t get paid for all of the time, or maybe you get paid and receive neutral or negative feedback. The thing is, communication is usually good. Just bringing it up allows the client, if reasonable, to look at it and say, “OK, perhaps this is getting out of scope.” Or, you might come to an agreement that this latest revision is in fact final. Honestly, this tactic never hurt me. I’m not promising it won’t ever, but that’s why it’s always important to remain respectful and professional throughout the entire process. One thing that gave me the confidence to say something is the fact that I had built up so much goodwill to that point. Goals and Metrics: Last but not least, your process isn’t complete without goalsetting and metrics. Look, I’m not going to spend a lot of time on how to create goals, etc. You should already know at this point what drives you. Only you know your true motivations. Is it money? Is it earning more experience? Is it building your portfolio? Is it building relationships? Whatever is driving you, quantify it, assigning a number, percent, etc. Build 5 strong relationships over the next two weeks. I’ll be honest again. I didn’t set goals immediately. I’m not saying you shouldn’t, as it’s one area where I probably dropped the ball. But, I know, too that I don’t really have an issue staying motivated, on-task, or focused on accomplishments. One thing that I have started doing, though, is verbalizing goals to others. Make your goals public so others can hold you accountable. If you tell friends and family you are going to write a book by the end of the year, you’re going to get sick of them asking you about it, and you having to respond with a made-up lie because you haven’t really started. It will push yourself to sit down and make actual progress, so you can share your progress with loved ones when they ask. You’ve probably noticed multiple references to being a good person. It should go without saying but sadly, a lot of people need reminders. The way I approach it is this. Every single person you come in contact can in some way, shape, or form impact your life down the road. You never know who the client is on the other end, which means they could turn out to be someone with hundreds of writing needs looking to start a relationship with a great person/writer. It could be someone looking to hire full-time. It could be someone you want to use as a reference down the road, and so on. So, I cannot stress enough that your attitude and the way you deal with people has a direct impact on your freelance success. It’s one big reason I feel I earned jobs right off the bat. I used people’s names, I showed interest in their postings, and I was courteous, even in the face of hostility. You are definitely going to come across people from all walks of life. Plus, remember what I said earlier, there are going to be times where you have to put your foot down, or maybe miss a deadline or need an extension. Your goal from the first interaction with your potential client is to show respect and be a good person. Such a makeup earns you the right to use a pass when needed. Not always, obviously, but sometimes. Client has to ask for multiple revisions; client gets frustrated. Client accepts mediocre content and leaves you mediocre/poor feedback. Client accepts mediocre content and never considers hiring you again. Client rejects mediocre content and files dispute so they don’t have to pay you. Client has few revisions and is happy their project is done in a timely manner. Client accepts great content and leaves you a glowing review. Client accepts great content and gives you a “tip” or extra money as a token. 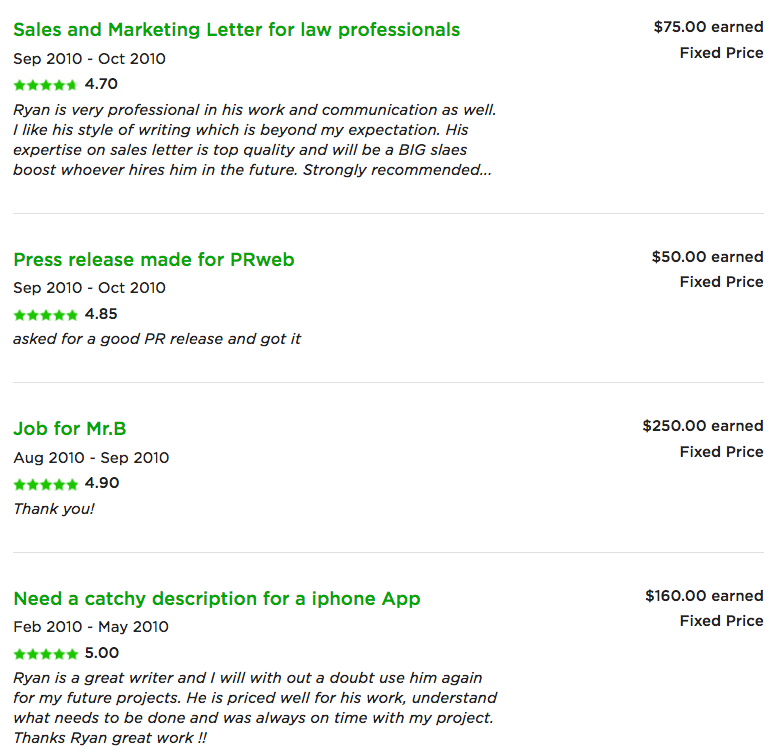 Other potential clients see your glowing review and are more apt to hire you. You take glowing review and put it on your website, or tweet it, post on Facebook, etc. Happy client goes straight to you next time they have a content need. Happy client gladly refers you to friends and family when they need assistance. Honestly, the reasons to and benefits from producing great content can go all the way down the page. And if you’re doubting any of it, you’re wrong. This stuff happens. And really, without those positive outcomes, you’ll hit a dead end quick. 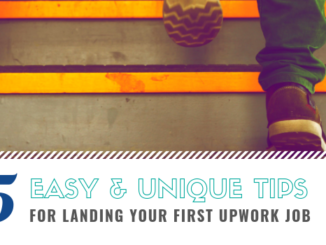 With them, you’ll propel yourself down the road to being one of the standout providers on a very crowded Upwork space. Many of my jobs were from repeat customers who didn’t even bother with bids from others, and instead came straight to me when they needed help. There’s nothing better. Think about the resources saved by working with repeat customers versus finding new ones. It’s ridiculous. Ok, so all of that had to do with trying to produce great content or the reasons you should. Let me talk about what great content looks like in terms of how it worked for me. This often results in stuffy content. Dull, boring, robotic, and way too formal. AND, content that sounds like something you can find on 98% of the websites, blogs, books, articles, press releases you come across. It might be well-written, which could earn you some decent feedback, but does it strike a nerve? Does it make the hairs on arms or back of the neck stand up? Does it result in any “a-ha!” moments. Or, is it just something that’s well-written? This is such a huge point, and it’s really something that made this all click for me. I never cared one bit about writing. It was just another school subject. Until one teacher really laid out the power of emotion in your words. The lightbulb went off for me right then and there. Before, everything was just words, but now, words were tools to make the reader feel something. So what do I mean? 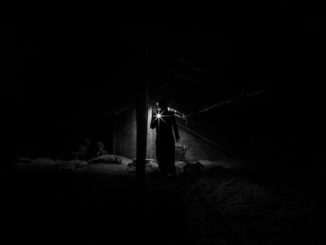 Here are a few examples of writing that breaks the mold; actual excerpts I have written with the goal of being emotional and conversational, to tell a story and really, be different. I chose product descriptions because those can be some of the dullest jobs around! Why not opt for a bookcase as striking as the collection of books that rest upon its shelves? Versatile for use in a number of different ways, our 100% solid oak bookcase impressively showcases contents – from books, vases, antiques and whatever else you might choose to display. Transform just another empty wall into a lively backdrop consisting of your most prized possessions. Only fools rush in, right? Ok, that may be a little harsh, but deleted for privacy doesn’t underestimate the importance of setting the stage before pulling back the curtain. Curb appeal stops buyers in their tracks; staging makes the book look as good as its cover; pre-market home inspection results in peace of mind when buyers need it most. When it comes to real estate, we are more than OK with being good at only one side of the equation—selling. We’ll let other agencies represent the other half, and want nothing to do with representing both you and your home’s buyer. We wouldn’t want our attorney representing our opposing party, so why would we put you in a position of having to work with a dual agency? We wouldn’t, and we don’t. Families, friends, experiences, and the like. Each day that passes presents the opportunity to meet someone new, do something different, and go somewhere you’ve never experienced before. But with the accumulation of memories comes the accumulation of, well, “stuff.” Trophies, awards, collectibles, furniture, knick knacks, and other doo-dads – we simply like to posses things of all sorts; keepsakes that remind us of all we’ve done, who we’ve met, and where we’ve been. Ok, almost to the end here. But last, and very importantly, make sure you leverage the relationships you’re creating with the jobs you eventually complete. Why waste all of that time and effort? Every door that opens leads to another door. If you’ve been different and disciplined, produced great content, and earned great feedback, go the extra step and cementing the relationship. Make sure you thank the client of their time and the opportunity. Check-in periodically on their ventures. All of this is done to keep your name on their radar for the next time they need help. Trust me, being the client and having to find freelancers isn’t a bundle of fun either; it’s grueling and stressful, as you never really know if you’ve made the right choice until you see what is produced. Thus, clients would much rather work with someone who produces great content, yes, but someone they know they can rely on. Well, finally. I hope I made an impression with all of this. If so, I’d love to hear from you. If not, then I’d still love to hear from you. I really do cherish feedback (and as a freelancer, you should to). I’m always happy to help as best as possible, so if you have a question or are stuck on something in particular, please don’t ever hesitate to drop me a line.